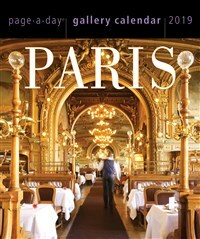 In stunning, richly detailed and evocative photographs, the PARIS GALLERY CALENDAR brings the city’s spirit and style to light. There are celebrated cafes, like Les Deux Magots. The world-class museums, like the Centre Pompidou and Musée D’Orsay. But also daily pleasures, like delicate financiers and canelés, tantalizingly arranged in patisserie windows. And the joy of perusing the book stalls that line the Seine, or the bric-a-brac at the iconic Porte de Clignancourt flea market. Mixed in with these lush, full-color images are breathtaking black-and-white photographs, like a candid shot of sunbathers on the Eiffel Tower’s deck in 1929.